WELCOME TO THE NEW ALUMNI SITE! The reunion committee wishes to thank everyone who was able to attend the reunion this last weekend. We appreciate that so many of you went out of your way to tell us how much fun you were having. It is not easy to know what is going to work and what is going to flop. Our greatest reward was seeing so many happy faces as you greeted and hugged long lost friends and acquaintances and got caught up on the latest events of your lives. THE REUNION WAS A SUCCESS!!! YEAH!!! And the entire committee thanks you all!! We are keeping this website active and calling it an "alumni" site instead of just a reunion site. You can help out by getting more people to come and create their profiles on this website. Check in on regular basis to keep you login password active. This website is where the information will come from when another reunion is planned. THIS PAGE IS UNDER CONSTRUCTION AS ARE MANY PAGES DURING THE TRANSITION FROM REUNION WEBSITE TO ALUMNI WEBSITE. THANK YOU FOR YOUR PATIENCE. 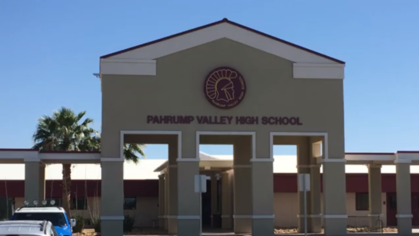 Welcome to the Pahrump Valley High School (PVHS) Alumni website. We invite everyone who graduated from PVHS to join this website by completing your profile. Once you have joined the PVHS Alumni website, you will have full access to all its features including classmate profiles, news feed, picture galleries, instant messaging and live chat. We look forward to hearing and seeing (post your old and new pictures) what you have been up to since graduation. Check in often for updates. If you are already a member of the PVHS website, please sign in. If you have not yet joined the PVHS website and you graduated from Pahrump Valley High School, click on the Missing Classmates link in the header above and then click on your name to register. For more information about this website, including privacy policies, please click on the First Time Visitors link. NOTICE: UPON POSTING YOUR PICTURES AND/OR VIDEOS ON THIS SITE, YOU ARE GIVING US PERMISSION TO USE THEM IN PRINT OR ELECTRONIC FORM FOR ENTERTAINMENT PURPOSES.